You Save: $6.40 (32%) Ships in 1 day. Soft Cover, 410 pages, 7.50 x 9.25. Want to become your own brewmeister? Homebrewing For Dummies, 2nd Edition, gives you easy-to-follow, step-by-step instructions for everything from making your first "kit" beer to brewing an entire batch from scratch. Before you know it, you'll be boiling, bottling, storing, pouring, and kegging your own frothy, delicious suds. Homebrewing For Dummies, 2nd Edition is fully updated with the latest brewing techniques and technologies and features more than 100 winning recipes that will have your friends and neighbors singing your praises and coming back for more. Part I: First Things First. Chapter 1: Welcome to the Wonderful World of Wort. Chapter 2: Setting Up Your Beeraphernalia. Chapter 3: Creating Your Own Department of Sanitation. Part II: It’s in There: The Nuts and Bolts of Beer. Chapter 4: Malt: A Tale of Two Sources (Grain and Extract). Chapter 6: Yeast and Fermentation. Chapter 7: On the Water Front. Chapter 8: Adjuncts and Flavorings. Chapter 9: Making Your Brew Bionic: Additives, Preservatives, Finings, and Clarifiers. Part III: Ready, Set, Brew! Chapter 10: Beginner Brewing Directions. Chapter 11: Intermediate Brewing Directions. 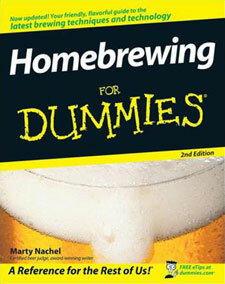 Chapter 12: Homebrewing Directions for the Serious Beer Geek. Chapter 13: Bottling Your Brew. Chapter 14: Kegging: Bottling’s Big Brother. Chapter 19: A Meading of the Minds. Chapter 20: Going Green: Being an Eco-Friendly Homebrewer. Part VI: Putting Your Brew to the Test. Chapter 22: Storing and Pouring. Chapter 23: You Can’t Judge a Bock by Its Cover: Evaluating Beer. Chapter 26: Ten (or so) Ways to D.I.G.I.B.I.Y. (Do It, Grow It, Build It Yourself). Chapter 27: Ten Gizmos That Can Make Your Brewing Easier. Chapter 28: Just the FAQs: Ten (or so) Frequently Asked Questions. Appendix: Ingredients: The Building Blocks of Beer. Marty Nachel is an award-winning homebrewer, an AHA/BJCP Certified Beer Judge, and was a beer evaluator at Beverage Testing Institute and the Great American Beer Festival.